The mission of the Lifestyle Enrichment Center of Columbia County Senior Services is to assist adults (60+) in maintaining their mental, physical, nutritional and emotional health for as long as possible, with the intent of seeing older people remain independent and in charge of their own lives. 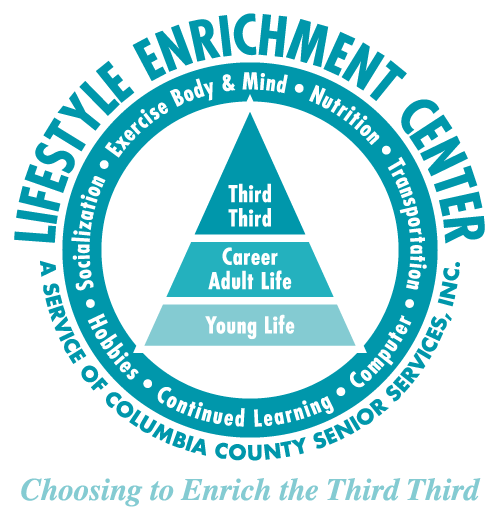 Our logo depicts the “Third Third” of life — after “Young Life” and “Career Life” — when you can do what you want surrounded by the activities offered at the Lifestyle Enrichment Center. We offer Dementia-specific adult day care (The Club located in the LifeStyle Enrichment Center). Licensed through AHCA (Agency for Health Care Administration). Columbia County Senior Services, Inc. was established AS A NON PROFIT 501-c-3 organization in 1972 to meet the special needs of the growing 60+ population of Lake City and Columbia County. The corporate head of the organization is a diverse all volunteer Board of Directors made up of concerned citizens from Lake City and Columbia County. The services are provided by paid professional staff. On July 7, 2015 CC Senior Services completed 43 years of service to the 60+ population in Columbia County. LEC celebrated 8.5 years in Ft. White and Lake City Lifestyle Enrichment Centers. The Club – Dementia Specific Adult Day Care also celebrated two full years of success. The Club had its first full inspection by the Agency for Health Care Administration with no deficiencies. In 2015 people are able to use the gym, painting, learning about computers, reading, participating in competitive games and acting up in the Geri actors theater group. The Friday Night Dance began in 2015 and continues to provide a safe environment for folks who love to dance. A full continuum of services are now provided that include not only in home family support, but direct care by certified nursing assistants, transportation, home delivered meals as well as enrichment activities that help to ensure wellness and longevity. The vision to accomplish the mission is to provide a continuum of services and care which offers people assistance at the level of care they need at different points in their lives. The services offered to the 60+ adult with their care-giver and family provide a holistic approach to active aging; services include a wide range of activities from physical fitness, mental acuity, and social connection, good nutrition and care-giver support. To treat senior adults and their caregivers with respect and dignity. To maximize financial resources to promote the health and welfare of senior adults. To encourage forward out of the box thinking. To encourage staff to develop new partnerships in the governmental, business and professional world. To value and reward professionalism and continued education. To provide and reward excellent customer service attitudes. Still have questions? We’d love to hear from you. Send us an email and we’ll get back to you as soon as possible. Thanks for your interest in what we do!